The Midori Brass series from Japan is a stationery line made of solid brass. This series proudly carries the “ages well”-signature; the longer you use it, the better it becomes. 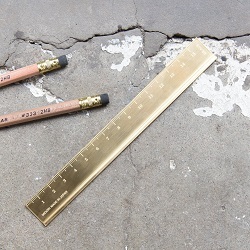 The MIDORI BRASS RULER fits nicely in the MIDORI BRASS PENCIL CASE.